life, unmasked: i am the older brother. | stuff antonia says. life, unmasked: i am the older brother. Last Thursday, I linked up with Sarah Bessey’s brilliant synchroblog, and wrote about what is saving my life right now. Or right then, rather. That week, it was New Mexico–everything from the earth to the sky and back again. You know what else saved my life that week, later that very day? My mom got a job. She’s been waiting, my family has been waiting, a cloud of beautiful witnesses we have filled our lives with has been waiting for three years. But can I tell you something else first? Even with all the blessing, even with the open hand that has been this week, I have been the other brother. You know the guy I mean– the older one in the parable, the one who cannot share in the joy when grace is extended to his prodigal sibling. One of my favorite paintings. 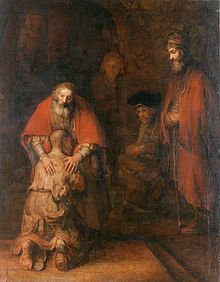 Rembrandt captures the moment of reconciliation between the prodigal son and his father, but also chooses to include the brother (on the right) in this particular scene. Notice the elder’s placement in the frame, his posture, his face. There is a feast, a fatted calf, but the older brother cannot bring himself to come to the table. It is a grace too extravagant, it is just too much. He doesn’t deserve it, the older one silently muses, positioning himself on a higher plane, as he imagines himself superior. He cannot bridge that space. And that has been me this week, in more ways than one. I have looked on the triumphs of others and begrudged, I have looked on these my own extravagant graces and named them burdens. I have chosen cynicism and unforgiveness. I have clenched my grip on possessions this week, like a toddler yelling mine. I have conveniently forgotten that I don’t deserve it, and none of it is really mine to hold. I have not looked on with joy, and so I robbed my own. And sure, these things are both the property of my fallenness and the condition of the broken world on any given day. The particular ugliness of my heart isn’t all that special. But what of the long-awaited blessing, the miracle we began with, the grace of it all, so imminent? It is all that darkness curled up with that much light that makes it hard to breathe. This entry was posted in life: unmasked. and tagged family, gifts, Grace, pride, prodigal son, spiritual. Bookmark the permalink. ← the stones i stood on firmly. Haven’t we all? Too many times to count. Sigh. But may we learn a little more each time how NOT to do it, but rather how to live with gratitude not only for our own blessings, but for the blessings of others as well. Thanks for sharing this and being vulnerable. Amen. Thanks for reading, Lisa. Oh, I hear you. I so effortlessly slip from embracing the life of the beloved to this role of older brother, sizing up and self-assured. I think I’ve recognized it, repented and embraced a lower place, and in no time I’m right back to judging, especially those I love most. I think what struck me most here was this: “But what of the long-awaited blessing, the miracle we began with, the grace of it all, so imminent? It is all that darkness curled up with that much light that makes it hard to breathe.” Will we ever stop wrestling with this? Thank you for the encouragement to engage this today. YES. That well-oiled pendulum gets me every time. Praying that we both walk towards mercy. Sarah, thank you for reading and following along. So honored. I just wanted to say hi as I found you through Sarah Bessey. I absolutely love the style of your blog. Beautiful. When I read this post I was reminded of a quote from Max Lucado that I keep on my fridge. I think it might help. I look to that quote when I’m feeling like you do, because almost always food comes as a comfort, which is why I put it up on my fridge. thank you for sharing and reading, Maree! Yes. So thankful that He is a God that will “race from a great distance” to meet us, and bring us in to the table. Pingback: on trespasses. | stuff antonia says.